What is a socially responsible company? Is it a group that uses only organic fibers in its apparel production? Is it a business that chooses to operate solely online, reducing the carbon footprint and environmental impact of each sale? Maybe it’s a factory that pays its workers above a living wage, ensuring they have safe, clean working conditions? Well, a socially responsible company does any (or all) of those things. However, sometimes the way a business chooses to give back includes donations to other organizations, non-profits that support causes a company stands behind. We’ve compiled a list of a few of our favorite “give back” companies. These businesses choose, either through financial or material donations, to support non-profit groups like OCEARCH, Boys & Girls Clubs of America and more. Scroll through this list and check out the charities. Then, choose your favorite products from women’s clothes, hoodies, jackets, yoga pants, leggings, sweatshirts, eyeglasses and confidently order! Whatever you choose from this list will directly benefit non-profits that work to solve environmental and social problems. Warby Parker is one of the most well-known manufacturers of high quality eyewear. They’re also a give back company; for every pair of glasses purchased, the company will give a pair to a student or low-income person who needs them. Warby Parker’s give back efforts also provide training opportunities to adults. These adults are taught to administer basic eye exams to low income individuals. For our Warby Parker review, we’ve chosen the Hallie frame. This pair of glasses is made from recyclable acetate and is available in three colors. Whether your prescription is single-vision or progressive, the frame will fit your lens. Alternatively, choose reading or non-prescription lenses. Warby Parker lenses offer 100% UV protection and include scratch-resistant treatment. To further protect your precious vision, choose light-responsive lenses that darken as you step into the sunlight. On rainy spring days, you need a place to stash your stuff. Why not carry your gear in style with this Crush It Backpack from Stella & Dot? This little backpack is perfect to carry to class or to the gym, or just to use as an oversized purse. Measuring over a foot wide and almost 16 inches tall, the bag is great for bringing your tablet, a book for the plane or a spare bottle of water for a long hike. As we researched this Stella & Dot review, we learned a few things about the company. Stella & Dot is a woman-founded and owned business that gives back to the community. First, Stella & Dot allows women to earn money – women who may otherwise not be employed. Secondly, the business donates to charities like Dress for Success and MOAA through fundraisers and physical donations. This waterproof backpack is just one of the great items available at Stella & Dot. Women who have worn the pack say it sits comfortable on your shoulders, but also is lightweight enough to carry using the handle. YETI is one of the “big names” in camping and outdoor gear. Each of their products are fair trade made, and most are designed in the United States. YETI gives back to local organizations upon request, and has donated thousands of dollars of merchandise to charitable organizations. For our YETI review, we’ve chosen the Rambler. The Rambler isn’t your typical water bottle; it holds a full 64 ounces. In other words, you can fill this bottle once a day and get all the water you need. Women who use this stainless steel bottle say it’s perfect for keeping track of water consumption or just for having on hand during camping trips. That said, most people say the bottle is a bit too heavy to carry along on a hike. You can customize your YETI. Choose from a variety of lids that suit your need. The bottle itself features an “over the nose” sip design, but you can change that by adding a chug cap or a straw cap to your order. Krochet Kids is a company we’ve mentioned in the past on Citrus Sleep. The group offers apparel and accessories for women, men and children. All are made under fair trade working conditions. In fact, each piece is hand-signed by the woman who crafted it, so you always know where your clothes come from! Krochet Kids partners with non-profit group Capable. Capable works with communities around the globe to create economic opportunities for people in extreme poverty. The group provides skills training and opportunities in nations like Northern Uganda – help where it’s needed most. We’ve selected the Wanderlove Long Sleeve for our Krochet Kids review. This soft tee is made from 100% organic cotton and spandex. We love the low-cut vee neck style and the feminine flare of the high/low hem and pairs well with yoga pants or leggings. The Wanderlove Long Sleeve is handcrafted by female artisans in Peru. Next on our list of companies that give back is our Southern Tide review. This company partners with OCEARCH and Folds of Honor. The former is dedicated to collecting oceanic data, tracking marine life and creating outreach programs to protect the world’s waterways. The latter supports families of fallen and disabled service members. We love the Southern Tide Skipjack Polo Shirt; it’s perfect for playing outside! Women have worn this piece sailing, walking the beach and just running errands on blustery days. A 3-button placket with seersucker ribbon trim lining adds to the appeal of the polo. There are plenty of details to love about the coat, too. A laser engraved logo buttons with coordinating color thread add interest to the polo. Best of all, the polo is machine washable! Lole is a Canadian company, based in Montreal. The group offers a line of activewear for women, all made under fair trade conditions. While products are designed in Canada, Lole’s products are made in Asia using manufacturing companies that have transparent supply chains. In fact, even the down used in Lole’s products is sourced from the farming industry in a cruelty-free way. Lole gives back to the community through its Yellow Label Program. Women can sent gently loved Lole products back to the company. Those products are then distributed to others, people who wouldn’t otherwise have access to clothing and activewear. Our Lole review features this Marin Cardigan. You’re going to love this sweater as much as we do. The dropped shoulders give the cardigan a feminine and casual look. The length of the top is perfect to wear over leggings or yoga pants. We love the straight fit of the sweater, too. Most importantly, the Marin Cardigan is eco-friendly! The soft, breathable fabric is made from cotton, ethically sourced wool and recycled polyester fibers. Layer this cardigan over a t-shirt on cool spring days, or just stay cozy around the house. Orvis is another name you likely recognize. The outdoors company boasts a full line of men’s, women’s and even pet products, all designed to withstand the elements. From windbreakers to hiking boots, Orvis sells just about everything you need to enjoy nature, regardless of the weather. The Women’s Drirelease Long Sleeved Quarter-Zip Tee is our choice for our Orvis review. The fitted and feminine top is moisture-wicking and naturally odor resistant. It won’t bunch, so you can wear it as either a top- or a baselayer. 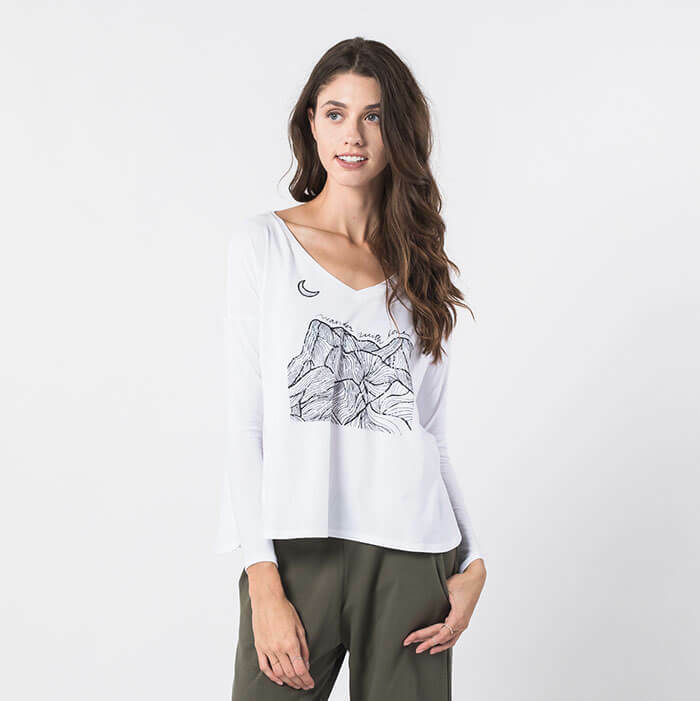 Women who own this top love it for hiking, climbing and cycling. Orvis donates 5% of its pre-tax profits to organizations that protect the environment. Groups that benefit from Orvis’s donations include American Rivers, Battersea and Casting for Recovery, among many others. Your purchase of this tee in one of four pastel colors helps support environmental groups. United By Blue is one of our favorite give back companies. We like that the company offers a huge range of products for women; from swimwear to puffer jackets, United By Blue has everything you need to stock your wardrobe. Each item is priced affordably and accessibly, and United By Blue gives back, too. The company organizes community groups to help remove plastic waste from oceans and waterways. In addition United By Blue is a a member of the Certified B Corporation. We’ve chosen a fun stylish look for our United By Blue review. This airy breathable button-down top is the ultimate in casual comfort. Functional buttons and a breast pocket add detail to the top, and the length is perfect to wear over your favorite organic cotton skinny jeans. As with all United By Blue products, the top is priced affordably. Choose from four different sizes to find your perfect fit. Women who have worn this button down say the fabric is airy and lightweight and the shirt is cool enough for even hot summer days. It’s the perfect coverup when you’re playing outside in the sun. The long sleeves protect you from UV rays while the loose fit of the cotton keeps you cool. From camping trips to coffee shops, this Coalatree Save the Bees tee will be at home anywhere. We love the unisex fit of the shier. It’s great for men, women or as a gift for your favorite eco-conscious teen. Roomy and soft, the tee is great for sleeping in, too! The Save the Bees tee is available in two colors; we love the light olive. Choose from four different sizes to create your new favorite casual look. Machine washable and dryer-safe, the tee is one you can wear every day. You’ll love that the fabric of this shirt contains organic and recycled materials, too! As we researched this Coalatree review, we discovered that the company has a few great initiatives to give back to the planet. First, all surplus materials from the company’s Kachula blankets are converted into warm, waterproof blankets for the homeless. The company also donates to groups like Save Our Canyons and Boys & Girls Clubs of America to support social and environmental programs. Have you ever just wanted to get in your car with a few friends for a long road trip? We have. Even if you can’t make it cross country right now, you can still express yourself with this Stoked All Day short-sleeve tee from Billabong. This tee is made from 100% sustainable cotton, and features a relaxed fit. The Billabong tee is roomy, oversized and offers just the right amount of stretch to allow you to move around comfortable. Women who love this shirt say it runs true to size, but for extra wiggle room, order a size up. What we love about Billabong is that it’s an unassuming brand. While researching for our Billabong review, we found virtually no mention of give back efforts on the company website. However, with a little digging, we discovered that the company gives frequently to Surf Aid International and Surfrider Foundation, two groups which support clean oceans and marine research. Lululemon isn’t the world’s hottest clothing yoga retailer. In fact, they’re trending in that direction, choosing to rely on social media and the quality of their products to grow the brand. However, despite the size of the company, Lululemon does have some impressive give back philosophies. Lululemon supports non-profit organizations such as I GROW CHICAGO, OURMALA and LOVEYOURBRAIN. For our Lululemon review, we wanted to share the Define Jacket. The jacket is made fromcotton soft Luon fabric making it moisture-wicking and great for regulating your temperature. Women especially love this top for running or jogging, even when the weather gets cold. Everyone needs a soft, warm hoodie in their wardrobe. That’s why we’ve chosen to include this Cotopaxi review in our list of the top give-back companies. This hoodie is a unisex fit, so feel free to gift one to everyone on your list. Even better, the top is made from recycled water bottles! Bottles are shredded and melted down into thin fibers which are used to create a comfortable, warm yarn. You can choose from red or green, but both styles relate a simple message: Do Good. Deep pockets keep your hands toasty while you watch the game or hike, and a drawstring hood keeps the wind from your neck and throat. Cotopaxi is a Utah based company that’s partnered with a few organizations to give back to the community. International Rescue Committee assists political refugees, while Educate Girls provides scholastic support for girls in India. Proximity Designs assists Myanmar citizens in gaining employment and achieving goals. Next on our list is this adorable jean jacket by Nau. The Kush Jean Jacket is short and sassy, the ideal length to pair with a maxi skirt or your favorite denim shorts. Five metal tack buttons let you bundle up on cooler days, and the jacket has plenty of pockets! Two chest pockets and two hand pockets keep your wallet and keys safe and sound. What we love most about the Kush Jean Jacket is its sustainability. The piece is made from hemp and organic cotton, two of the most renewable materials on the planet. While exploring the company for our Nau review we actually found that most fabrics the company uses are sustainable! Recycled down, alpaca wool and recycled polyester are a few of the materials you’ll find in Nau apparel. In addition to incorporating sustainability practices into daily operations, Nau also gives back to Partners for Change. The company donates 2% of its profits to the group. Those funds are then used to support Mercy Corps, a global humanitarian organization. Last on our list of the top give back companies is something for the girls. Younger women need comfortable, sassy shoes, too, so we’ve included this Hari Mari review just for them! Rather than select one shoe, we’re featuring the whole line of Hari Mari Girls’ Flops. These flip flops are guaranteed to protect even the smallest feet, offering a gentle “break in” period, memory free foam for cushioning and carbon-free, slip-proof rubber soles. Sustainable materials are used when available, and Hari Mari even offers a recycling program! Parents are encouraged to send used shoes back to the company; in exchange they’ll receive a 15% discount on a future purchase. Hari Mari has launched an initiative called Flops Fighting Cancer. The company donates 1% of the profits from flip flop sales to cancer research programs and groups that support cancer patients. Organizations include local charities and children’s oncology centers such as Cook Children’s and Dell Children’s Medical Center of Central Texas.